McLeod Cranes places the aluminium lid on the new Joyce Road reservoir. Photo: McLeod Cranes. 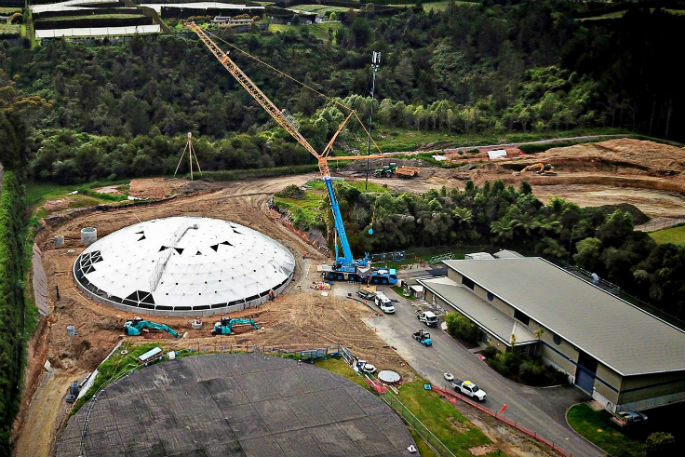 Tauranga city’s newest reservoir at the Joyce Road treatment plant has been constructed with an aluminium geodesic dome roof – design easier to install and self-supporting, and doesn’t need the internal columns or roof-supporting beams that a traditional concrete roof requires. The new roof is much lighter and easier to maintain than some of the older reservoirs in service. The new reservoir is partially buried.